Prime Minister Narendra Modi said both countries will make defence cooperation stronger, including advancing maritime security and disaster response. India and Malaysia will deepen cooperation in security and defence, Prime Minister Narendra Modi said on Monday as he emphasised that the recent attacks globally and the "ceaseless" terror attempts against India and Afghanistan were a reminder of the global nature of terrorism. 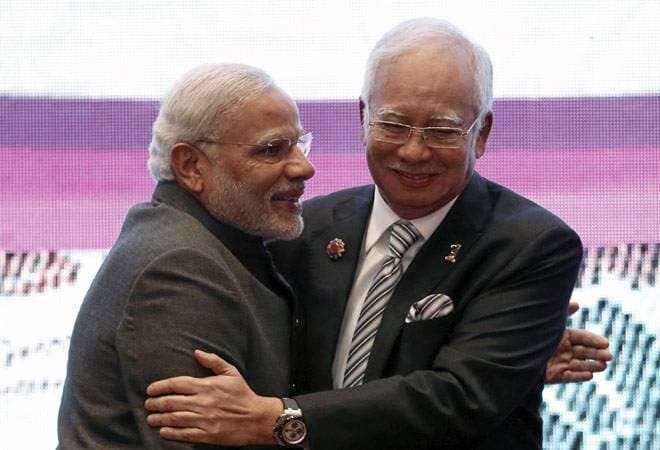 Modi also complimented his Malaysian counterpart Najib Razak for providing leadership in combating extremism and radicalisation, rejecting any link between terrorism and religion and in highlighting the "real values of Islam". "I am particularly grateful to you for our security cooperation. It underlines our shared commitment to deal with our security challenges. We will continue to deepen our cooperation in this area," he said in a joint press briefing after his talks with Najib at Putrajaya, the sprawling administrative capital on the outskirts of Kuala Lumpur. Modi, who was at Putrajaya to attend the ASEAN and the East Asia Summits, said recent spate of attacks in different countries, "not to mention the ceaseless terrorist attempts against India and Afghanistan are a reminder of the global nature of this threat." Appreciating Najib's leadership in combating extremism and radicalisation, Modi said this is a great contribution an important aspect of global efforts against this challenge. Warning that terrorism is the "biggest threat" to the world, Modi had on Sunday said it should be delinked from religion. "I am pleased that we have agreed to upgrade our joint exercises and set up the SU-30 Forum," he said, adding that both sides will do more in terms of level and complexity of exercises and collaboration in training and defence equipment. "Our agreement to cooperate in cyber security is very important. As our lives get more networked, this is emerging as one of the most serious concerns of our age," Modi said. The Prime Minister said he shares Najib's belief that bilateral trade and investment relations can be scaled up significantly. "We intend to exploit the full potential of our bilateral agreements and the India-ASEAN Agreements. We look forward to an early conclusion of the Regional Comprehensive Economic Partnership Agreement," he said. Modi expressed confidence of taking the bilateral strategic partnership to a new level. India and Malaysia also signed MoUs on cyber security, culture and public administration.